NOTE: If you are not a moderator, this script won't add anything for you. All it does is shows the user's timeline (which is publicly visible on their profile) on the moderator dashboard to make it easier for mods to see what users have done since a moderator last intervened. I recently suggested on Meta.SO that moderators have the ability to see problem users' recent activity through some sort of watch list. Fellow moderators expressed significant interest, and as a moderator on Super User, I know it would help me, so I went ahead and created the feature as a user script since it wasn't picked up by the SE team. This script will add the ability to view the 10 most recent actions in any annotated user's timeline, exactly as it is displayed on their regular user profile. 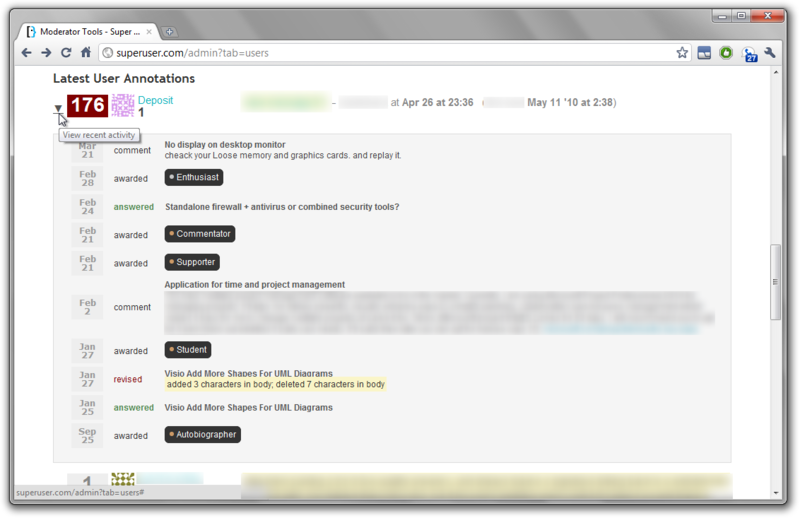 Just click the small arrow by a recently annotated user, and their recent activity will be displayed below. Click the arrow again to hide the timeline. Download the script, then follow the instructions on the Stack Apps script tag-wiki. Tested on Super User, since that's the only site I'm a mod on. In theory, should work on any SE site. If it doesn't work on the site you moderate, let me know and I'll try to figure out why. Tested in Firefox 4 w/ Greasemonkey and Chrome 11. Bug fix: new profile design deployed network-wide broke AJAX call. Fixed call to grab the right URL. Script is at the same URL, just reinstall it to fix.